More decorative contractors are using dyes to rev up their color palettes. Dyes are available in tones more vibrant than possible with most stains, such as red, yellow, orange, purple and cobalt blue. And the colors can easily be mixed at the jobsite or diluted to obtain a multitude of other shades (see this color chart for Brickform's Dye-N-Seal). Both water- and solvent-based dyes are available, with each type having unique qualities. 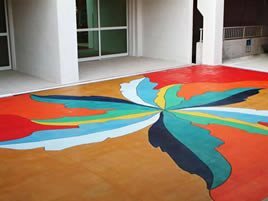 Unlike acid stains, dyes are not chemically reactive with concrete; instead, they contain very fine color particles that penetrate the concrete surface. Dyes tend to produce tones that are more predictable and uniform than stains, but it's still possible to achieve interesting color variations. Where to use: Dyes can be used as a stand-alone color application or layered over stains or integral pigments to enhance or intensify the color. (For more information, read Concrete Dyes Expand the Color Palette of Concrete Stains.) Because of the broad array of color options, concrete artisans often turn to dyes to create elaborate graphic compositions. Many dyes also take well to polishing, and some products are specifically formulated to impart rich color to polished concrete floors. Limitations: Like chemical stains, dyes have some transparency, so they will not disguise flaws in an existing surface or mask an underlying color. Dyes are not as UV stable as stains and may fade when exposed to direct sunlight. If you are considering using a dye for an outdoor project, be sure to check its suitability for exterior applications.